Talk about the ultimate “can’t win” situation, imagine you’re the guy who’s been selected to replace Babe Ruth as the Yankee’s starting right fielder. That was the role given to this Canadian in 1935 after the Yankee front office gave the Bambino his unconditional release. At first, Yankee fans did not approve. The first Yankee home opener without the Babe in right field drew just 29,000 people to the Stadium, the smallest opening crowd since New York had moved into the place, twelve years earlier. Selkirk responded admirably. He certainly was no Ruth but he did hit over .300 in five of his first six seasons with New York and he drove in 100 runs during two of those years. Most importantly, the Yankees kept winning without their Sultan of Swat. 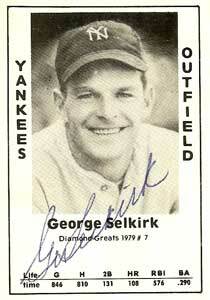 Selkirk earned five World Series rings during his nine years in New York. What really helped take the pressure off of Selkirk was the continued remarkable performance of Lou Gehrig and the just as remarkable emergence of Joe DiMaggio as the next Yankee superstar. George was nicknamed “Twinkletoes” because he walked and ran in a distinctive style, up on the balls of his feet. Unlike Ruth, Selkirk also had a keen mind. He’s credited with coming up with the idea for baseball’s warning track to help cut down on the violent collisions suffered by so many Major League outfielders back in the day. When World War II broke out, Selkirk enlisted in the navy and became an aerial gunner. He never again played in a Major League game. He started managing in the minors, eventually became Kansas City’s Director of Scouting and then the first General Manager of the expansion Washington Senators. He was born in Huntsville, Ontario, in 1909 and died in 1987. Also born on this date was this fifth starter on the Yankees’ 2001 pitching staff, this former Yankee reliever and this former Yankee GM.